Cavelle Francis | First Financial Security, Inc. Thorough. 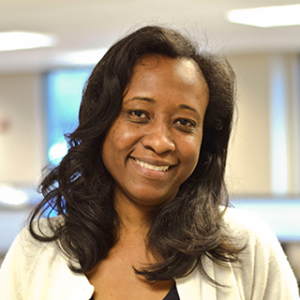 It’s probably not the first word that comes to mind when describing First Financial Security, Inc.’s Manager of Corporate Development, Cavelle Francis. You might think instead of her warm smile or friendly spirit. But Cavelle says it’s this hidden talent – her thoroughness – that’s been invaluable not only in doing her job, but also to becoming a trusted resource to First Financial Security’s field representatives. In her role with the company, Cavelle is involved in all aspect of the Operations Department. She has lead several teams during her time at FFS and in each of those roles she has always worked to find innovative ways to better serve First Financial Security’s field associates. With roots in the Island nation of Trinidad and Tobago, Cavelle grew up in a close-knit family in Westchester, NY. After earning a degree in Business Administration at Iona College, she had the opportunity to work for Market Research firms in several states before her family relocated to Georgia. Cavelle has the distinction of being one of the first employees hired when First Financial Security opened its doors in 2006. She enjoys the camaraderie and family-like atmosphere in the home office. But the thing she likes best about her job is the interaction with field representatives. In her spare time, Cavelle, who lives in Covington, is a voracious reader and loves all kinds of music.